White kimchi refers to any style which does not contain red pepper powder. It pre-dates spicy kimchi in Korea by several hundred years. 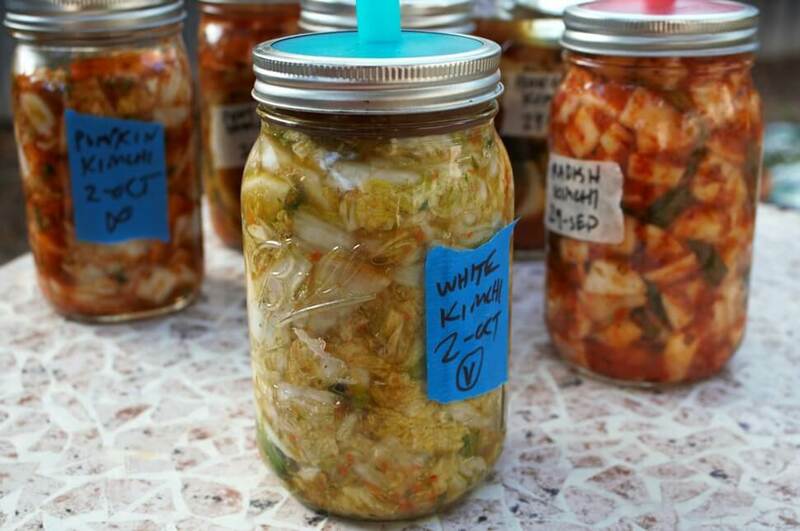 There are many ways to make white kimchi. This is the “mak” or sliced cabbage style. We also have a more “formal” white kimchi in quarters recipe. Wash and rinse cabbage with fresh water to remove dirt. Remove any outer leaves from the cabbage and set aside. Chop cabbage into 1-inch chunks/strips. Slice the core very thinly. (Some discard the core, but you can slice it and include it). Peel and cut stems off radish. Cut into ¼"/ 6mm coins using a mandoline or knife. Add cabbage and radish pieces to the brine in a large container or mixing bowl. Cover with a something to weigh the veggies down so that the contents submrege under the brine. Put a bowl or plate underneath the container to catch excess overflowing brine.Let soak for 1-2 hours. Drain the veggies through a colander, reserving 1 cup/ 250 ml of the brine. Chop scallions into ½" /13mm slices. Add to work bowl of a food processor or blender. Peel and roughly chop the garlic and peel and slice the ginger. Add to work bowl. Roughly chop the carrot and the mushrooms and add to work bowl. Peel and core the Asian pear. Rough chop and add to work bowl. Add soy sauce to work bowl. Run food processor until ingredients are all incorporated and a thick paste forms. You can adjust by adding more tamari/soy sauce or reserved brine to make it smoother. Now the fun part! Wear a latex or plastic glove to protect your hands from getting stinky. Mix the veggies and paste together thoroughly with your hands, coating each piece, in a separate large mixing bowl or directly in the fermenting container. Secure container with a weight and airlock (follow instructions for applying). If not using airlock, add a weight on top of the veggies to keep the contents down underneath the brine. Cover container with a dish towel or tea towel to keep out flies and dust. Secure with a rubber band, twist ties or elastic strap. Store in a dark place in your kitchen for at least 5 days. When you like the taste and texture, remove any airlock or weights and transfer to a refrigerator. Cabbage kimchi will keep in the refrigerator for up to 3 months. After that, it may lose texture, at which point you can use it for cooking.